December 11 - NOAA released the 2018 Arctic Report Card at the American Geophysical Union fall meeting in Washington, D.C today bringing together the work of 81 scientists from 12 nations to provide the latest in peer-reviewed, actionable environmental information on the current state of the Arctic environmental system relative to historical records. The Arctic continued it long-term warming trend in 2018, warming at twice the rate relative to the rest of the globe with Arctic air temperatures for the past five years (2014-18) exceeding all previous records since 1900. Arctic sea ice in 2018 remained younger, thinner, and covered less area than in the past. The 12 lowest extents in the satellite record have occurred in the last 12 years. 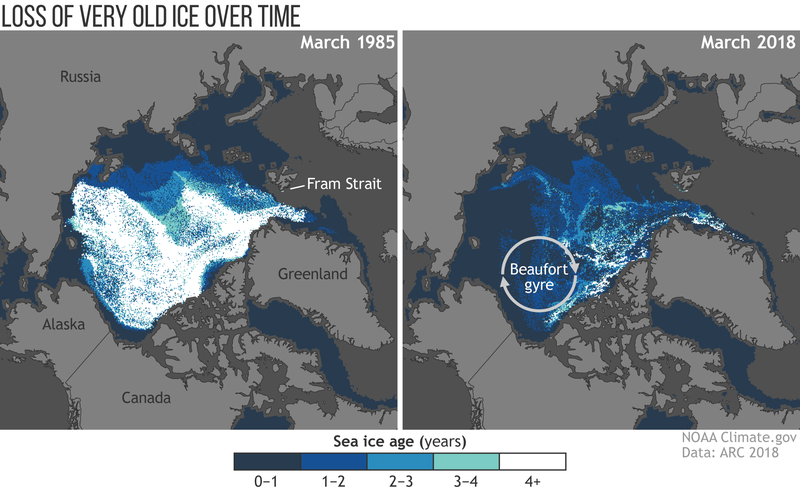 In the Bering Sea, winter sea ice extent reached a record low for virtually the entire 2017-2018 ice season, which typically begins to form at the beginning of October, expands through the winter and then melts through the spring. During two weeks in February, typically the height of winter, the Bering Sea lost significant ice cover, about ~215,000 km2 or about the size of Idaho. Ocean primary productivity levels in 2018 were sometimes 500% higher than normal levels in the Bering Sea which is linked to the record low sea ice extent in the region. The Bering Sea is an important commercial fishing region and supports a vibrant sea ice-ecosystem with abundant seals, birds, and other pelagic species that critically depend on the timing of sea ice formation and retreat. PMEL’s Dr. James Overland and Dr. Muyin Wang co-authored the surface air temperature essay and Dr. Carol Ladd co-authored the sea surface temperature essay. Read the NOAA Press Release here.